If you are trying to upload a custom weather file and get the "Error Parsing File" message it's possible the formatting for your weather file doesn't match what HelioScope is looking for. Everything in the weather file you are uploading needs to be in the exact right format or you will get an error message. In many cases it is easier to take the critical columns from your weather file and paste them into a weather file that is known to upload into HelioScope. Below are the steps to get your weather data into a working weather file. Step 2: Use Excel to copy the following values from your weather file and overwrite the sample weather file. Be sure to only adjust the values starting in row 3, do not change the column name. The first row in the sample weather file contains information about the weather file. The most important fields to update are Latitude and Longitude (Column E and Column F) so the weather file shows up in the right location. Below is a list of all the 7 fields in the first row of the sample weather file. 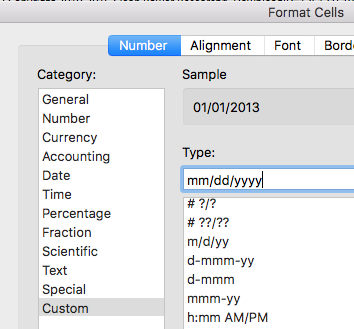 Excel's date formatting can break the weather file parser. You will need to make sure it is in MM/DD/YYYY format before saving. Under Custom manually enter "mm/dd/yyyy"
Woo! You did it! Head over to the Weather File Uploader and watch the blue progress bar pat you on the back. For more information on how to use the weather file uploader, please read our weather file upload help doc.